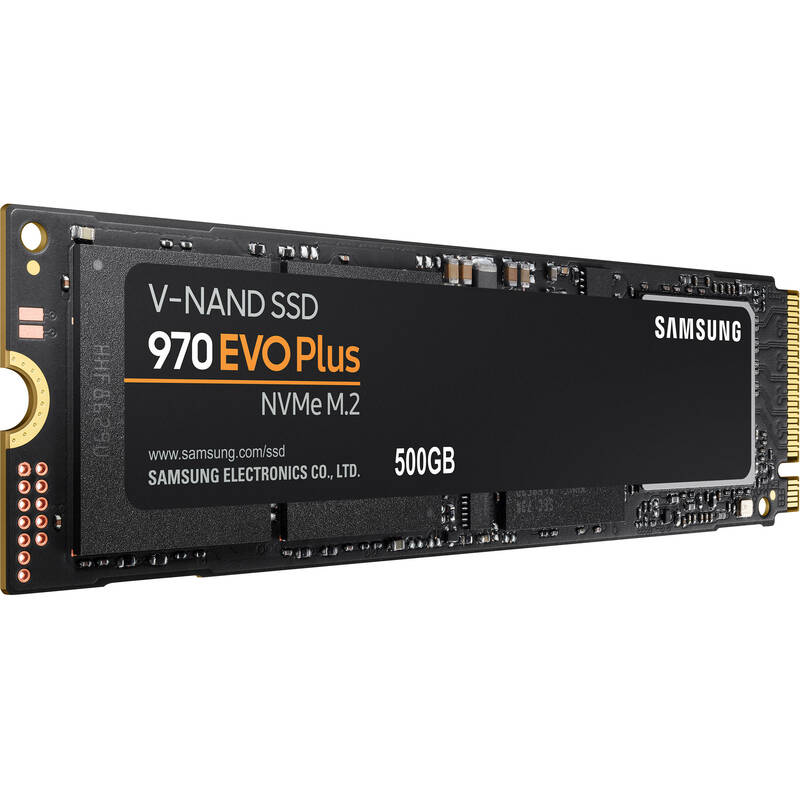 Built using their V-NAND 3-bit MLC flash technology for reliable performance, the 500GB 970 EVO Plus NVMe M.2 Internal SSD from Samsung offers enhanced bandwidth, low latency, and power efficiency. Designed for tech enthusiasts, high-end gamers, and 4K & 3D content designers, it delivers sequential read speeds of up to 3500 MB/s, sequential write speeds of up to 3300 MB/s, an endurance of up to 300 TBW, up to 1.5 million hours MTBF, AES 256-bit encryption, and support for both SMART and TRIM. Moreover, it has an M.2 2280 form factor, which is compatible with a wide range of devices, and utilizes the PCIe 3.0 x4 interface. Download Samsung's Smart Magician software to track your drive's health, performance, and install new updates, while Samsung's Dynamic Thermal Guard helps reduce the risk overheating to minimized performance drops. Faster than the 970 EVO, the 970 EVO Plus is powered by the V-NAND technology and firmware optimization. It maximizes the potential of NVMe bandwidth for powerful computing with a reliability of 300 TBW. The EVO 970 Plus reaches sequential read speeds of up to 3500 MB/s and sequential write speeds of up to 3300 MB/s.Powered by V-NAND technology, which improves NAND performance and delivers higher power efficiency, along with optimized firmware, a Phoenix controller, and Intelligent TurboWrite boost speed. The 970 EVO Plus fits 500GB onto the compact M.2 2280 form factor, greatly expanding storage capacity and saving space for other components. Samsung's technology empowers you with the capacity to do more and accomplish more. Get up to 300 TBW with a limited 5-year limited for lasting performance. 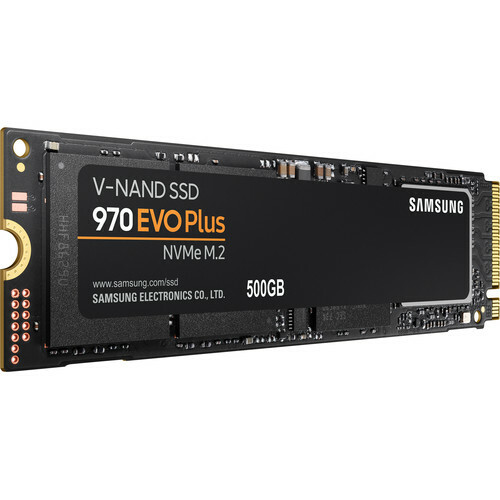 The 970 EVO Plus provides endurance powered by V-NAND technology and Samsung's quality. Samsung's nickel-coated controller and heat spreader on the 970 EVO Plus enable improved heat dissipation. The Dynamic Thermal Guard automatically monitors and maintains proper operating temperatures to minimize performance drops. Box Dimensions (LxWxH) 5.6 x 3.95 x 0.9"
500GB 970 EVO Plus NVMe M.2 Internal SSD is rated 4.8 out of 5 by 13. Rated 5 out of 5 by Cullen from Blazing 6x Speed B&H give the best service you could ever ask for and this drive is totally smoking fast. I had a 500 gig Samsung EVO SSD boot drive to start with. Using Samsung Magician I did a before and after performance test. This new NVMe drive was about 6x faster across the board on reads and writes. Nuff said. Installation was very easy as was cloning the original boot SSD. Setting up the new SSD as the boot drive, while keeping the original SSD installed gets a little tricky but it’s all doable. I highly recommend this new NVMe drive. Rated 5 out of 5 by Honey Cat from Upgrading OMEN 880-160 Bought barebones OMEN then did my own upgrades,the 970 EVO + 1TB was one of the upgrades, boots in 6secs. and programs load fast. Rated 4 out of 5 by Unreconstructed from Boot time doubled With my old system and a 850 Evo as my boot disk, my boot time was 8-9 seconds. Now that's 32gb ram, 4790k CPU and gigabyte z97x Mobo. With a Asus Maximus hero xi, 9900k, 64gb trident ddr3000 and a 970 Evo plus....15-16 seconds. Have tried clean install and only drivers updates and still the same. Samsung magician states the drive is running at advertised speeds so not gonna hammer the issue but this being my first experience with m2 drives and I'm not that impressed. Maybe I'm missing something but temps are not a issue, stability not a issue, 970 drivers not a issue and OS integrity not a issue...nor bios settings. I would rate it a 3 star but it works and by no means is it slow but to double my boot time rates it at 3.5(4) stars. Would I recommend anybody buy a m2 drive over a standard SSD? Nope. Rated 5 out of 5 by Virgil from Great Drive Very fast drive has improved load times by huge amounts. Went from 2-3 minutes on Atlas to 14-20 seconds. Worth the money. Rated 5 out of 5 by 379MAN from Pubg Works great with ryzen super fast , great on pubg fps are better I dont know why people on youtube say its does help it does big time. Rated 3 out of 5 by Joseph from Its OK So far I have been a little disappointed with this drive. I do not get the advertised speeds in benchmark testing. Furthermore Samsung Magician does not recognize the drive and thus cannot be managed by the program. I suspect it has to do with running the M.2 slot in RAID vs. AHCI however the drive does not boot in AHCI mode. Rated 5 out of 5 by Brett from Very fast, easy to install This speed improvement over an older SATA SSD is great. It took about 10 minutes to do a clean install of Windows 10 and all went smoothly. Samsung makes the best SSDs and this was another great experience. Rated 5 out of 5 by David from super fast primary drive Using as my C drive. Boots up fast. Applications start fast and run fast. Im happy to have such a fast system, even if it costs more than a standard ssd. Is this compatible for a macbook pro mid 2014? Unfortunately not since the Macbook has a different pin layout for the ssd. But there is an alternative (a bit more expensive but compatible) https://www.bhphotovideo.com/c/product/1239059-REG/owc_other_world_computing_owcssdab2mb05k_480gb_aura_internal_pcie.html It comes in a 480GB and a 1TB with or without an enclosure. The enclosure would be helpful if you plan on cloning your OS and software and you can use your current ssd externally as a portable drive. Will this be compatible with my Lenovo X1 Carbon 4th Signature Edition? Yes, this will work if you are comfortable with replacing these types of parts and possibly opening the machine. How does the encryption work? Assume full disk encryption, but how is key derived/stored? I haven't encrypted any of mine (I have several) but I remember Samsung Magician having an encryption settings menu that is drive based. Simply download it from Samsung under tools. Or, you could use Bitlocker on Windows I believe, even for PCIe M.2s. I hope that gives you a direction to start with, sorry couldn't help more.